YoWorld Forums • View topic - Male Hairs from Female boxes? Male Hairs from Female boxes? Did anyone else buy female hair boxes from the salon? I bought two and received two male hairs in them. lol I double checked in my invo and yep they are both male hairs. Re: Male Hairs from Female boxes? No it was from the Salon. When you go into the salon you only open one of the other (male or female), unlike the pop up one. Ew! I hope they can fix it, I haven't bought any yet but I don't want to get a male one. Pinkylola (235554) wrote: Ew! I hope they can fix it, I haven't bought any yet but I don't want to get a male one. LOL neither did I, haha. It is only happening if you buy from the Salon. The pop up for the hairs seems to be working fine. They put the Pigtail Hair Mystery Box into the category with Trending Hairs and Trending Hair Mystery Box into the category with Pigtail Hairs in the Salon. The hair boxes are giving out the right contents, but the boxes themselves are in wrong categories. YoJohn (135968828) wrote: They put the Pigtail Hair Mystery Box into the category with Trending Hairs and Trending Hair Mystery Box into the category with Pigtail Hairs in the Salon. The hair boxes aren't giving the right hairs, at least as far as my inventory goes lol. I have the two male trending hairs in my invo and can put them on. 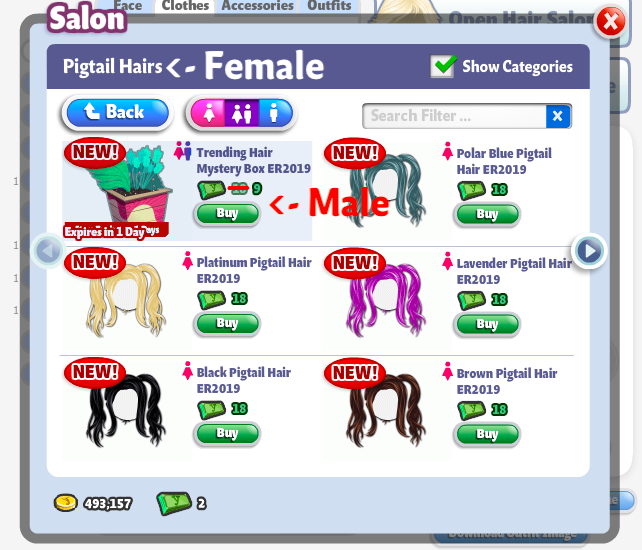 In the store, the FEMALE hair is in the MALE store category. 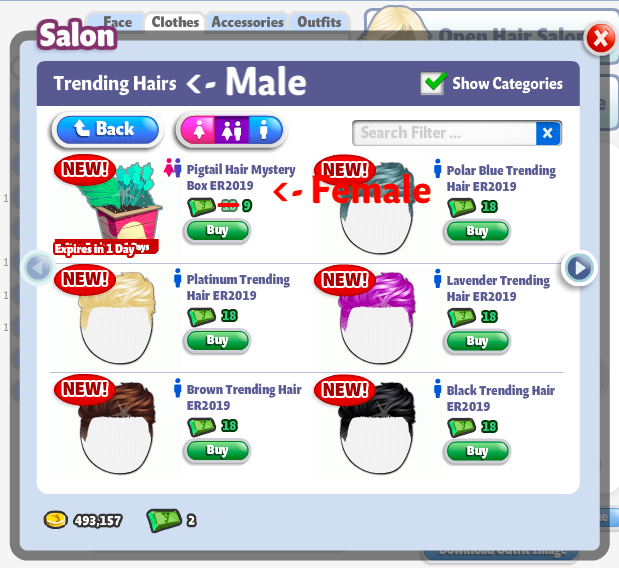 The MALE hair is in the FEMALE store category. Although you were looking for the right hair, BVG themselves have put the wrong box. You said you bought them from the Salon. Go there, and check it – there is the box with male hairs in the category where there are the female hairs. Leeum, it's okay to display them when you are broke, it is a no-no only when you are rich. YoJohn (135968828) wrote: Leeum, it's okay to display them when you are broke, it is a no-no only when you are rich. Location: Right here...in the moment! At least now I know Im not the only broke Yo here. If you really want people to notice you, be a typo. Location: Near Uranus checking for sticks. Ohp! Found one. Last edited by bu773rfly (393723) on Wed Apr 17, 2019 11:28 pm, edited 1 time in total. I always say use both you eyes when buying.